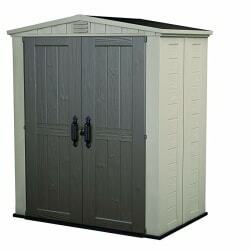 Walmart offers the Keter 6x3-Foot Resin Storage Shed for $365. Opt for in-store pickup to avoid the $100 freight shipping charge. That's the lowest price we could find by $66, excluding the mention below. It has a lockable double door, 113-cubic feet capacity, and external measurements of 70" x 44.5" x 82"
I ordered one because the reviews seem decent for the price/features and it uses an induction motor like higher dollar models from other brands. Price is currently $99 but using an email to sign up for 20% promo/coupon gets the price to $79. Bed Bath and Beyond has the Dyson V8 Absolute on sale for $349.99 and use those 20% off coupons for $279.99 after coupon plus tax.